Christopher Nupen's film The Magics of Music offers an intimate portrait of the young piano star Daniil Trifonov on and off the stage. Watch this unreleased version of the film, exclusively edited for medici.tv! These hands make magic. A magic which we cannot explain, but which can touch us in ways which we do not forget. And once that happens, our response calls us back for the rest of our days. That is just one of the magics of music. It is multi-faceted, multi-colored, and always different in every different pair of hands. These are the hands of Daniil Trifonov, an artist whom nature has endowed with the most prodigious gifts. A maker of magic in his search for beauty. Daniil Trifonov on Camera, The Magics of Music is a film by Christopher Nupen. The original version (released on DVD by Allegro Films) won two international prizes, the Silver Medal at the New York Film & Television Festival and the Accolade Award, and won this year's ICMA DVD of the Year Award (the top award for classical music DVDs). The film shown here is an unreleased version, newly edited exclusively for medici.tv. Christopher Nupen guides us through the pianist's life, interviewing Trifonov himself as well as his famous professor, the esteemed pianist Sergei Babayan. Babayan recounts an anecdote about when he advised his student to avoid looking down too much at the keys when playing, urging his student to practice in the dark as if he were blind. 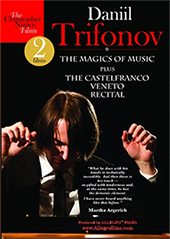 Trifonov practiced for hours until the technique was fully mastered. Indeed this student was always eager to learn and improve. For Babayan, his student-teacher relationship with Trifonov is unique. Martha Argerich once said of Trifonov, "What he does with his hands is technically incredible – and then there is his touch – so gifted with tenderness and, at the same time, he has the demonic element. I have never heard anything like this before." Since winning the XIV International Tchaikovsky Competition in 2011, Trifonov has travelled the world as a recitalist and concerto soloist. In this movie, he takes the time to revisit the beginnings of his exceptional career. Born in 1991 in Nizhny Novgorod, by age five Trifonov's urge to compose had surfaced, and in the interview he discusess his personal understanding of magic in music. No doubt, Daniil Trifonov is some kind of a magician. Discover the full-length version of this film on DVD! Daniil Trifonov: The Magics of Music & The Castelfranco Veneto Recital, by Christopher Nupen.